Great Grandma survived just fine without a refrigerator. If we lose electricity, I have alternative methods of heating, lighting, cooking and I could do just fine except for the lack of a refrigerator and freezer. Yes, we’ve planned for that and have a back-up generator but that will only work until the fuel is gone or the generator breaks down. Is it really possible to have a long-term solution for refrigeration that doesn’t require electricity for emergencies? Absolutely. The answer can be found in the age-old art of “root cellaring”. All you need is a cool, humid, dark, ventilated area that can be easily accessed and you have the ability to significantly extend the life of fruits and vegetables. Let us begin by reviewing some basic principles of root cellaring that you need to understand to get started. The goal of a root cellar is to create the optimal environment to extend the life of fresh produce without the use of electricity. Throughout history, root cellars have played an important part in providing food through the winter for families. Incorporate these basic principles into the design of your root cellar. 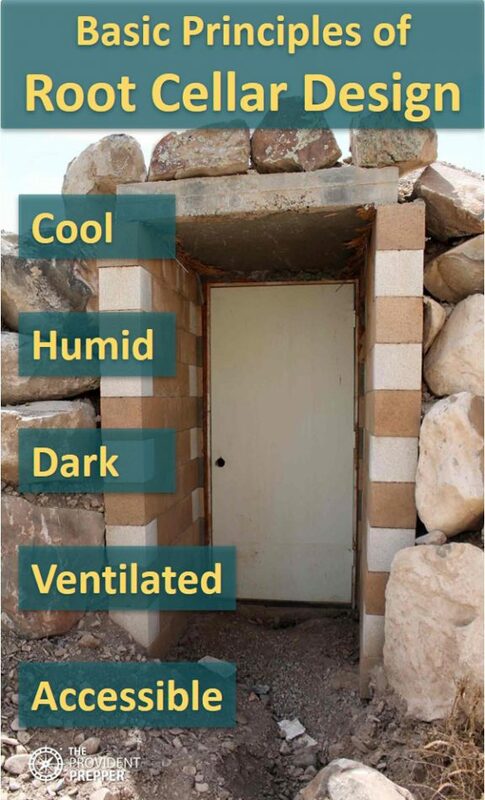 The optimal temperature for a root cellar is between 32°and 40°F. The cooler the temperature, without freezing, the longer the food will last. Locating the root cellar in an ideal place is critical to maintaining the best temperature to extend the life of the produce. Select a site with good drainage and minimal sunshine. A north sloping hill or shaded area is best. The earth is a natural insulator which is why root cellars are frequently underground. The root cellar should be constructed below the frost line whenever possible. Piling insulation on top will help to maintain a cool temperature and avoid freezing. Regulating humidity is a must in a root cellar. Dirt or gravel floors allow the earth to naturally humidify the air which prolongs the life of produce. Good drainage ensures the area will not become waterlogged. Light is an enemy to stored fruits and vegetables. Dark helps to reduce food deterioration and does not encourage sprouting. Ventilation assists in control of both temperature and humidity. It moves ethylene gas which is produced by ripening produce, increasing storage life and quality. Air movement reduces mold and mildew. An accessible location increases overall functionality and usefulness. If it isn’t convenient to run out to the root cellar for the stored apples or pears, you are not likely to take full advantage of the delicious, nutritious foods you have stored. We make it a habit of bringing in enough produce for a week or so every time we get food from our root cellars because takes a bit of effort to access them. I would definitely visit more often if it was simply a matter of taking a little walk and opening a door. Each of our situations is a bit unique, but don’t let that stop you from taking advantage of a root cellar. One of my goals is to build a quality underground root cellar that is designed specifically for the purpose of storing all of my garden bounties. In the meantime, we have created some good alternatives that get the job done. Remember, unlike a refrigerator, the temperature in a root cellar will fluctuate which may make it unsafe to store some foods such as fresh meat. However fruits, vegetables, and eggs all store very nicely. Now on to some great ideas for inexpensive root cellar solutions. We decided to experiment with a buried freezer until I can build my dream root cellar. I have been pleasantly surprised at how well it has performed. It is on the north side of our home. It is a bit of a pain to access, so we bring in enough potatoes to last for a few weeks or so. Check out Chillin’ in Our DIY Buried Freezer Root Cellar to see how we accomplished this. Basements tend to be significantly cooler than the main level of a home due to the insulation of the earth. We have a designated place in our basement food storage room where we store fresh fruits and vegetables. We line the bottom of the boxes with a kitchen towel and it seems to help them stay fresh longer. We have a mixture of homegrown store-bought produce. All of it stays fresh significantly longer in the basement than in the pantry upstairs. Our friends make use of an unused basement bathroom to store winter squash. The ideal storage requirements of winter squash are 50° in a dark room. They allow the winter squash to ripen in the sun as much as possible. Then each squash is washed off with a weak bleach solution and allowed to dry completely. The squash is stored on ventilated shelves and are not allowed to touch each other. Butternut stores longer in the upright position. They keep the window cracked and cover the heat vent. The winter squash will store for well over a year when stored this way. If you have an existing crawlspace, you may want to consider converting an area into a cold storage room. Select a cool spot away from heat sources such as water heaters or furnaces. Adding sturdy shelving will significantly increase the amount of usable storage space. Dirt floors are optimal as they regulate the humidity well. Our storage room had a concrete floor so it was not optimal for storing produce but it still did a great job of extending the life of the produce. The photo shows how we stored all of our food storage in a crawlspace with a concrete floor. The lack of humidity was better for the boxed foods. The ceiling was a bit low, but it worked great. Be creative and remember to provide adequate ventilation. Extend the life of root crop vegetables by storing them in a plastic tote tucked in sawdust. The sawdust helps to regulate moisture and will keep the produce from touching each other. The tote ensures they are kept in the dark. When we harvest our potatoes, we select the very best to put into storage. Anything that is oddly shaped, cut, too large or too small is used right away. 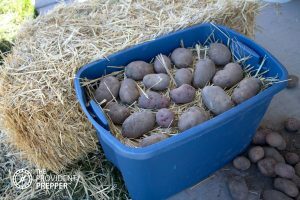 We have been quite successful in storing both potatoes and beets using this method in a tote. The sawdust or straw can be reused for subsequent years but will need a little bit of time to dry out. I was invited into an older home that had a clever little cold storage area. A hole had been cut in the basement wall which led out to an empty space under the front porch and steps. The storage area was lined with rigid foam to provide additional insulation from outside temperatures. A little light had been installed to help visualize the contents of the little storage closet. The entrance was cleverly disguised to blend in with the paneling in the family room. It was small but could probably hold a couple hundred pounds of potatoes. It was a great idea to take advantage of a little bit of unused space. An underground barrel is an inexpensive and reliable favorite. Uncle George buried a metal garbage can upright with holes drilled in the bottom for drainage. The lid fits snugly to keep rodents out. He built a simple wooden box cover to place over the top of the barrel. He insulated the barrel by covering the top with a nice thick pile of leaves. Leaves are placed in the bottom of the barrel and then he layers vegetables and leaves alternately in the can. The vegetables never freeze but stay nice and fresh through the winter months. 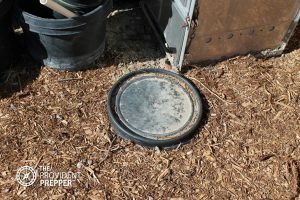 Another friend of ours buried 15-gallon plastic barrels with holes drilled in the bottom as well as the sides of the barrel to increase humidity control. The top of the barrel is at ground level and he reports that he has no issues with freezing even though winter temperatures will fall below zero in our area. We store carrots and beets through the winter using this method. The vegetables seem to get sweeter and sweeter and are absolutely incredible by the time March rolls around. The goal is to insulate the rows well against the freezing temperatures. I prefer to put wet leaves in large black garbage bags with a few holes poked in them. They are very easy to remove when it is time to dig up the carrots. We harvest enough carrots to last a few weeks when there is a break in the winter storms. The bags insulate the root crops well and keep the ground from freezing. As a bonus, when spring comes the leaves are well on their way to becoming compost. Paul is an expert gardener and uses a bit of a different method. He cuts the tops off of all of the carrots they dehydrate, bottle or use and piles them on top of the remaining bed to be used as insulation. Then he covers the row with a thick plastic tarp and places bricks around all of the edges to keep it in place. Every week or so all winter long he will venture out to harvest fresh carrots that are full of Vitamin A and other important nutrients. I think that storing them in the ground is a lot less work than bottling and dehydrating them … and the carrots taste incredibly sweet. Can’t find any other place? How about converting a basement window well into a little root cellar. We had pretty good luck with this version. Access was easier than venturing outside in the cold. We selected a window well on the north side of the house and covered it with a sheet of OSB and then added a layer of straw bales. The goal is to keep it very cool but prevent freezing. The bottom of the window well is filled with gravel so it did a great job of regulating the humidity. Plastic milk carton crates worked well to hold the produce and allow good air circulation. The crates stack nicely, taking full advantage of the small space. We used darkening curtains to try to keep light out of the window well. We filled our window well root cellar with potatoes and winter squash, along with a few mouse traps. It was nice to access the stored produce from inside the house but it was a little bit challenging climbing up through the window to get the potatoes. I have a friend who stores his potatoes and onions in an outbuilding. He puts them in mesh bags on the north side of the building under a thick black tarp. He keeps a window open just a crack to make sure they stay cold enough without freezing. This method has worked well for him for many years. A buried box may do the trick to store some produce. Dig a hole about 2′ x 2′ x 4′ feet (or larger) and construct a wooden box to put in it. Drill a few holes in the bottom for drainage. Line the box with mesh hardware wire to keep out rodents. Place a layer of leaves, straw, sand or moss on the bottom then add your vegetables. Place 3-4 inches of additional insulation material on top of the vegetables and set the hardware cloth lined lid on top. Then place bales of straw or hay on top to insulate it. Keep the bales of straw dry by covering with a tarp. A common old method of storing potatoes, and other root crops, was to just dig a pit in a well-drained shady spot. Make sure that water will drain away from the pit and not into it. Cover the bottom of the pit with sand or sawdust. Fill the pit with the root crop. Add more sand or sawdust and a thick layer of leaves or straw. Cover with black plastic sheeting. Be sure to use something such as rocks, bricks or logs to weigh down the sheeting and keep it in place. Use a thermometer to check temperature ranges. Look around and think creatively. How did Great Grandma survive without a refrigerator? She used a hand-built root cellar and was able to live quite well. My friend, Kathleen Kay, shares exactly how life was before refrigerators. I share “Grandma’s Ways,” with her permission. “Have you ever wondered how Grandma ever functioned without electricity? 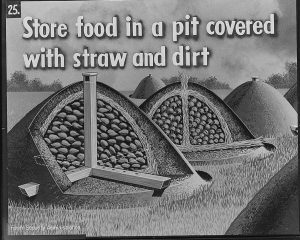 … Let’s start with root cellars. We had one out on the ranch. It had been dug down into the ground about 7 or 8 feet. The sides were reinforced with cement. It wasn’t the fine quality we have today, oh no! There were all these chunks of rock sticking out of it. Gravel wasn’t crushed in those days. At one time it had actually been white-washed but in my day it was just gray. There were shelves built all around the sides with a sort of counter at the back. I imagine the room was probably 8 feet wide and 10 or 12 feet long. The roof was constructed of heavy timbers that looked like railroad ties. Outside the roof was mounded over with several feet of earth to keep it cool and to prevent rain from leaking through. Great Grandma survived without a refrigerator and electricity. When the lights go out, you can thank Grandma for reminding us of the age-old practice of root cellaring as well as many other forgotten arts. Root cellaring is an exciting way to increase your self-reliance and ability to live providently. Canning, dehydrating and freezing your harvest takes significant time and energy. Why not consider storing some of that harvest in a good root cellar and eat it fresh throughout the winter months? How about purchasing some delicious apples from a local farmer’s market and enjoying them for months to come? Apples, pears, oranges, potatoes, carrots, beets, onions, garlic, winter squash, nuts, eggs, and so much more store nicely for extended periods in a good root cellar. 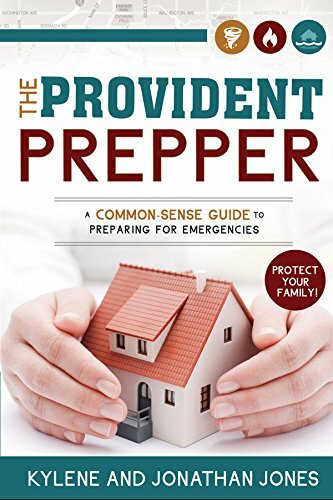 Take time now to find a way to extend the life of your fresh produce so that when disaster strikes, you will be ready to make it without your refrigerator.